Fourth-grader Katie Jordan dreads walking to school with Claire Plummer, her neighbor across the street. Both girls are motherless: Katie, since her dad’s divorce from her mom who left to become a country and western singer; and Claire, whose mom died when she was young. Claire’s constant taunts about having a perfect home and family get worse as Thanksgiving approaches. Not long before the holiday, Claire thrusts a household magazine at Katie, showing her how she and her dad plan to have a huge, perfect holiday with tons of food, decorations, and guests. Tired of Claire’s ridicule, Katie feels a bit envious and wants to prove her family is just as good as Claire’s. Katie is aware of her messy house, her messy little brother Tyler, and the fact that her family always spends their Thanksgiving in their pajamas, eating pizza. But this year Katie wants to gain an advantage over Claire by proving the Jordan family can be perfect, too. She makes lists of everything she will need and of the guests she wants to invite. Then her dad finds out what she is up to. He nixes her plans, stating he is too busy with his job to deal with all the work involved; plus he wants to spend the day relaxing. What is worse, Katie’s teacher is thrilled to accept the invitation Katie has already extended to her so she will not be alone for the holiday. Now Katie is trapped. Can Katie pull it off and prepare a traditional feast or will her plans go awry? 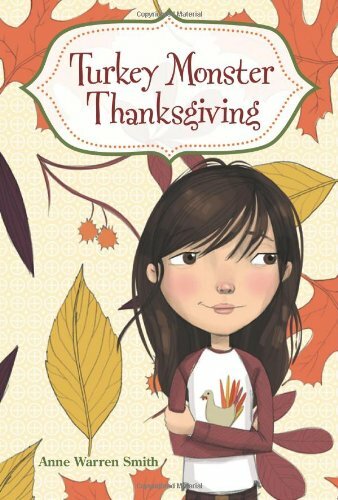 Turkey Monster Thanksgiving portrays the angst of a young motherless girl and how she deals with her feelings of not having a “normal” family. The use of humor and problem solving making this a read children will savor.